Bluebonnet’s Folic Acid 400 mcg Vcaps provide pure crystalline folic acid in easy-to-swallow vegetable capsules for maximum assimilation and absorption. 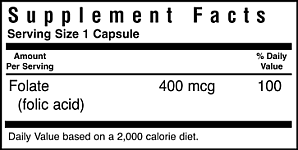 Directions: As a dietary supplement, take 1 capsule daily, or as directed by a healthcare practitioner. Other Ingredients: 100% Kosher vegetable capsules, vegetable cellulose, vegetable magnesium stearate. Free Of: milk, egg, fish, crustacean shellfish, tree nuts, peanuts, wheat, soybeans, corn, yeast, gluten, barley, rice, sodium and sugar.